The Eiffel Tower is in Paris, France. When we said that, we did not say much because this information is known around the world. 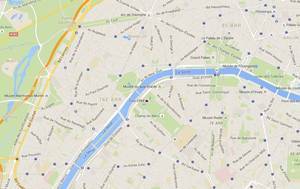 It is therefore more interesting to specify that it is in the center of Paris, on the banks of the Seine, in the 7th arrondissement. It is exactly between the Trocadero, in the North, and the fields of Mars, in the South, the Seine separating the Trocadero from the tower. Even further south, there is the military school and its very pretty facade. 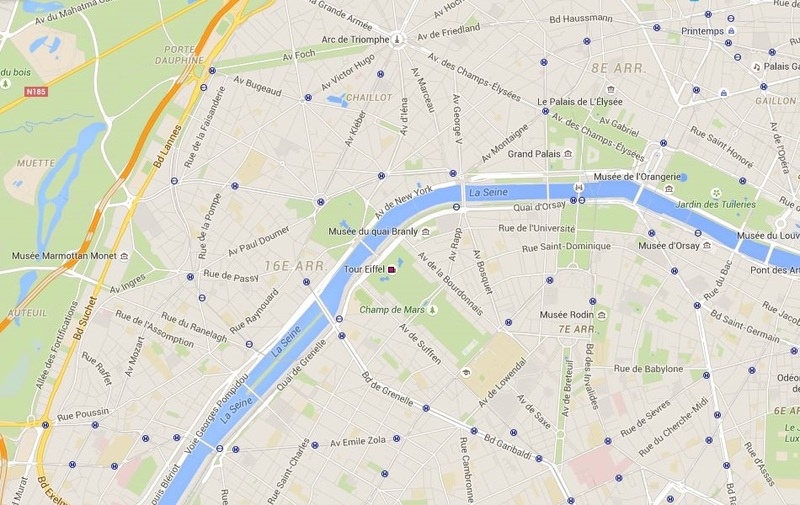 There is another way to find the location of the tower when you are in Paris: Raise your eyes! It is so imposing that we see it well, as long as the perspective of the avenues leaves a little space to see in the distance, or you are a bit high, because otherwise the buildings mask it anyway easily. Its GPS coordinates are exactly 48 ° 51 '30.13' 'North and 2 ° 17' 40.13 '' East. 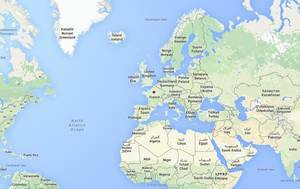 If you have the Google Earth software, click on this link or open it by double-clicking it, once downloaded: It will indicate the exact location of the Eiffel Tower: Google Earth link. 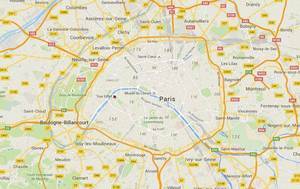 There is some information on how to get there on the page dedicated to the Eiffel Tower. 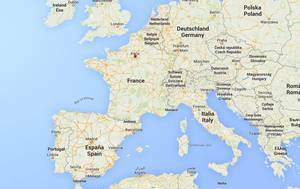 From a general point of view the Eiffel Tower is on the European continent, in France. Let's go down to see her a little closer. 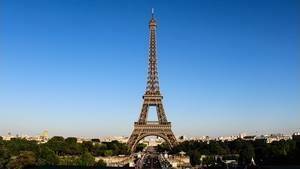 The Eiffel Tower is located in Paris, north of France. 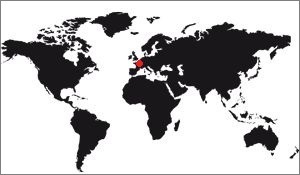 The Eiffel Tower is in Paris itself, in the center. 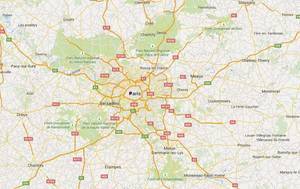 The Paris region is made up of a large number of contiguous cities. The Eiffel Tower is in Paris itself, in the center. 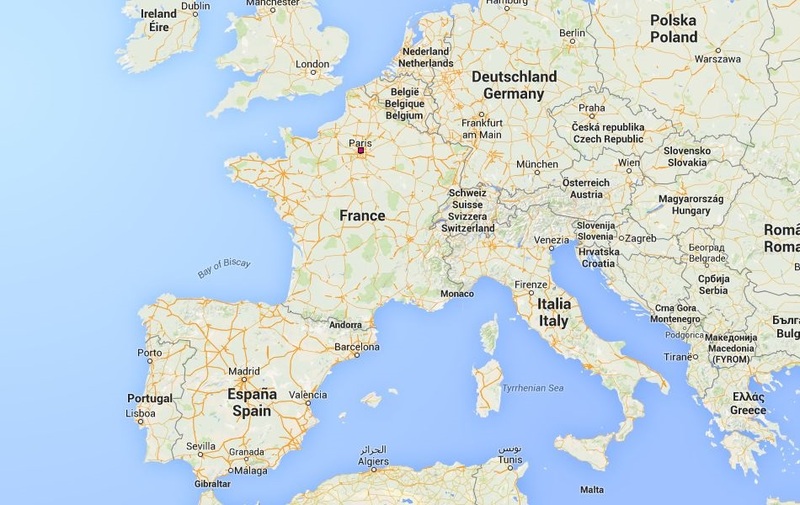 Paris and the location of the Eiffel Tower. Close view of Paris, we see that the Eiffel Tower is northwest of the city, without being too eccentric. Eiffel Tower and Place de l'étoile district. View of the district of the Eiffel Tower and Place de l'Etoile. We note that the tower is in the fields of Mars, a large area of greenery, that it borders the Seine and that the Trocadero Palace is behind it. 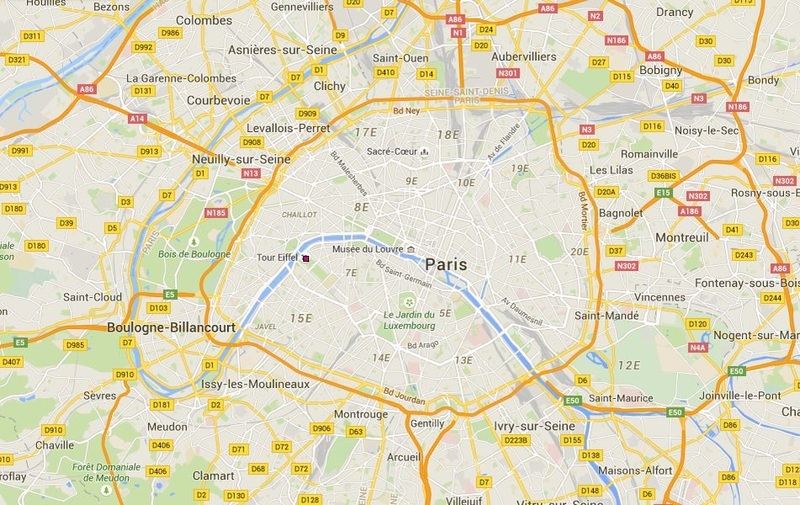 Precise location of the Eiffel Tower. 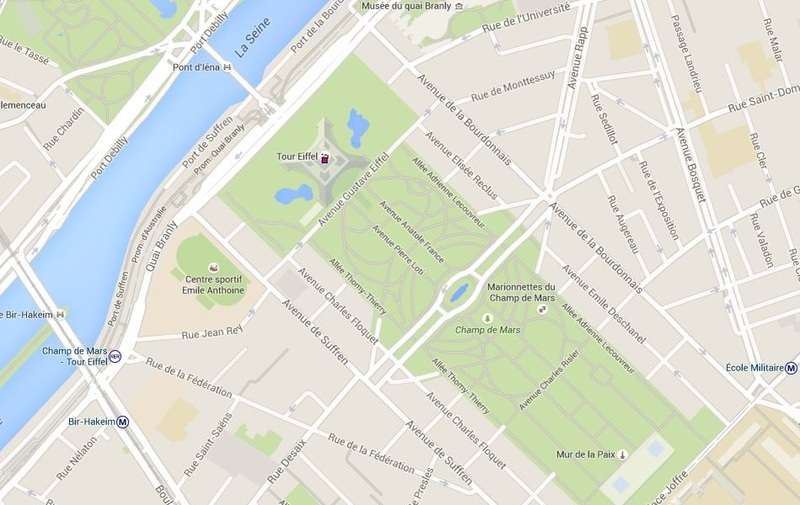 Precise position of the Eiffel Tower in the Champs de Mars. The Eiffel Tower is one of the most visited monuments of Paris, it is also the one that we see the most easily, although the Sacred Heart, in Montmartre, is very visible too. As a tourist you will have to move from one monument to another. 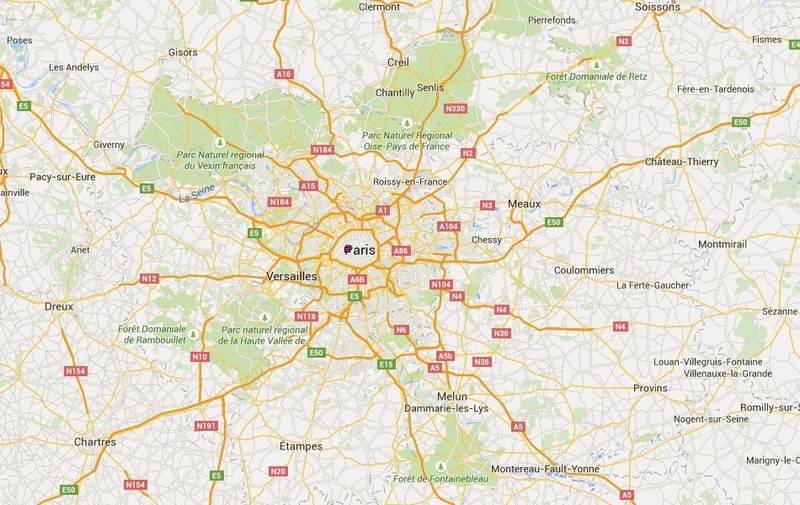 Here are the distances between some Parisian monuments. The most famous monument nearby is the Arc de Triomphe, on the Place de l'Etoile. This is the starting point of the famous Avenue des Champs Elysées. To go there you cross the bridge of Jena, then you cross the gardens of Trocadero to the North and you take the avenue of Jena. It is stack 2Kms, it is done without problems on foot. For simplicity, cross the bridge of Jena, go to Trocadero and take Avenue Kleber, it leads in a straight line to the Arc de Triomphe, which you will see from afar. There is 400m more. As the crow flies, the two monuments are separated by 1Km 700. The Invalides are closer, they are only 1Km 360 as the crow flies. 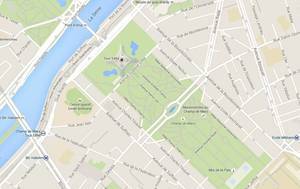 On foot, you will have to go down the fields of Mars and at the military school, follow Avenue de Tourville which leads directly there. For the Sacred Heart, count more than 7kms of road, it is further. You will have to go to the North-East of the city, on the hill Montmartre. The route is too complex to be explained here, but be aware that as the crow flies you are only 4Kms and a half. For the Louvre, it is enough to cross the bridge of Jena and to follow the quays, on the North bank of the Seine, it leads you directly to the museum. There is still 3Kms and a half of walking, it is not next. As the crow flies, it is 2Kms 900. In general it is always better to take the metro to go from one tourist site to another, the distances in Paris are still quite long, and even if you have the impression that this is not the case, once in the city the large rectilinear avenues take care to remind you. More fun, know that the Eiffel Tower is located in 5 853Kms and 90m to the Statue of liberty (United States), at 339 Kms and 780m to the tower of London (United kingdom), at 9 146Kms and 810m to the Corcovado (Brazil), at 1 110Kms and 770m to the Colosseum (Italy), at 8 240Kms and 190m to the Forbidden city, at Beijing (China), at 6 771Kms and 880m to the Taj Mahal, at Agra (India), at 3 215Kms and 150m to the pyramid of Cheops (Egypt) and at 10 022Kms and 640m to the Machu Pichu, in Cuzco (Peru) ! One can ask the question of the reason for the construction of this tower in Paris. Indeed, why was it not built in London, Rome, or even New York? The answer lies in the fact that it was Gustave Eiffel who first took up the challenge of the architects of the nineteenth century. Reach a 1,000-foot (300m) tower. This challenge had never been explicitly stated, but all the architects of the time were aware of the impossibility of erecting a construction, whatever it may be, of more than a certain size. With its 169m, the obelisk of Washington was, together with the tower Mûle Antonelliana of Turin the tallest building in the world, but it was also a limit that the classic stone construction had reached. To climb higher, you had to invent something else, other construction techniques. That was the challenge. And it is Gustave Eiffel, a French engineer, who solved the problem by using iron, a new material for the time. He had used it many times in his previous constructions and had made it a specialty. The iron was a lightweight material, flexible, convenient to climb in height and it is thanks to him that a tower of more than 300m could be raised. But why in Paris? Simply because at the time he had the know-how, the preparatory committee for the 1889 World Fair, to be held in Paris, launched a competition to build it, this tower. The committee received several files, but it was Eiffel's which was retained. It was to serve as a gateway to the exhibition and show all the know-how of the French in the industrial field. One must nevertheless know that the erection of a 300m tower was attempted in London, around the same time. It must have been a little bigger, but this tower was never finished, in fact it was just started. Photographs of time shows it reached a height (approximate) of about twenty meters. But it is the proof that different projects were born towards the end of the XIXe century, and finally it is in France that it was concretized. The initial project of Mr Eiffel's tower was presented to the organizers of the Barcelona World Expo in 1888! It is indeed in Spain that the engineer presented his project, initially. But they refused, saying it was too expensive. So he returned to the World Fair in Paris the following year for that. But the Eiffel Tower could very well have been in Barcelona, ​​and still be there. See also: History of the Eiffel tower. What the book says about "The 300m tower"
This book was written by Gustave Eiffel himself to recap the various data of the construction of his tower. There is a chapter on the reasons for the construction in the fields of Mars. Here is how Alfred Picard speaks in his General Report. The first question to be answered was that of the final location of the Tower, serious objections were made to the choice of the Champ de Mars, and was it rational to build the Tower at the end of the Seine Valley? it would not be better to place it on a high point, on an eminence, which would serve him as a sort of pedestal and increase its relief, and would not this gigantic pylon crush the palaces of the Champ de Mars? to build a definitive monument in the location where future exhibitions would undoubtedly be organized, to be bound to necessarily make it part of these exhibitions, while the novelty of the installations is one of the essential elements, if not the essential element of success? " "The critics were serious, but by moving away from the Tower, the financial success of the company would have been compromised and a large part of the profit it had to bring to the Exhibition would have been lost. The choice of the latter site was only between the Champ de Mars and the Place du Trocadero, and the adoption of the latter site would only have gained a height of about 25 meters, a very small figure in relation to the 300 meters. of the Tower, it would have given rise to the most serious difficulties for the foundation of the foundations on a ground deeply excavated by the old quarries of Paris, finally the immediate contact of the monument with the palace of Trocadero would certainly have produced a disastrous effect. "The Champ de Mars had to be accepted, and besides its disadvantages, this solution had real advantages: it made it possible to use the Tower as a monumental entrance to the Exposition, opposite the bridge of Jena, to avoid as a result the construction of a special entrance and to realize on this head a big economy, while endowing the concessionaire with a subsidy of 1.500.000 francs. This last consideration, which had so precisely hit Mr Lockroy may not have been appreciated enough. "